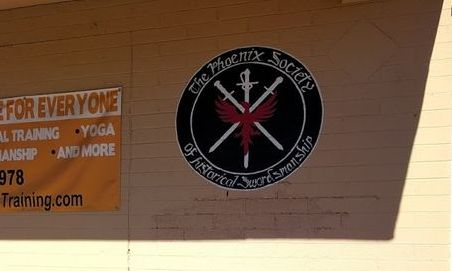 The Phoenix Society has a brick and mortar place to practice. It wasn't always that way! Today, John Patterson and I have a brick and mortar gym. It wasn't always that way. The original practice venue of the Phoenix Society of Historical Swordsmanship was my car port. How do you go from a car port to a real and established place? This article will cover that. It's not the most thrilling read, but business is business. I'll discuss how I made it and then provide specific advice throughout. I will also cover dues, non-profit vs profit status, the IRS and more. When I formed my own club, it had a grand membership of two. It was just John and I. I had come from a background of swordplay for many years and John had a general background of bad-assery. 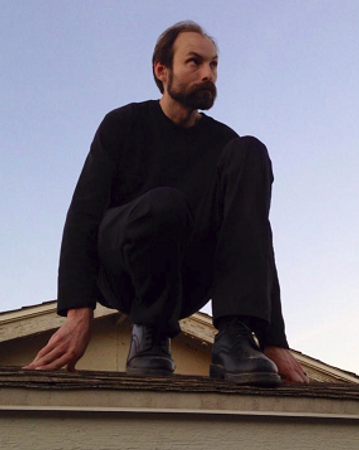 Here I am perched on my roof overlooking the city. It was from here the club started. Does two make a club? Yes. We practiced in my car port about once a week. My goal was to teach John as fast as possible so that the two of us could teach more people. This was not me as a sensei under the waterfall ready to dispense knowledge over a period of thirty years, this was me trying to create a fellow teacher. The car port had its issues. Namely, only two people could fit under it at a time. It also made passing by traffic ogle and frown. We did gather more members. We didn't have a name, a logo, a uniform or even know about the HEMA Alliance. For those who are wishing to teach HEMA at the early stage, it only takes two. A master and an apprentice. From there, you can build. However, you need a core of talent and should be on the lookout for talent who can teach. While some clubs have just one teacher and administrator, the Phoenix Society has many, giving us the ability to get quite a bit done and teach an ever-growing number of students. A key reason we have grown from park to brick and mortar facility is that we have the means to teach many. A club needs a logo and title, a uniform, a website and a you-tube channel. We slowly formed this and the title of our you tube channel, Swordpals, is because that was going to be our name as per John, lest we come up with a name. We chose the Phoenix Society of Historical Swordsmanship. The name is well chosen. Some clubs have fancy sounding names, but good luck finding them on a casual internet search. Our name was chosen to make it easy to find. 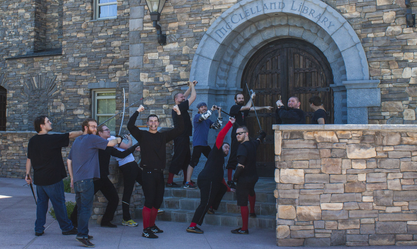 Anyone in Phoenix who types in swords, or sword fighting, or historical fencing will find us. After I had a core of members, I learned from Jim 'Papa' Barrows the basics of Fiore's longsword. For years I went to his house, where he was operating out of his backyard. 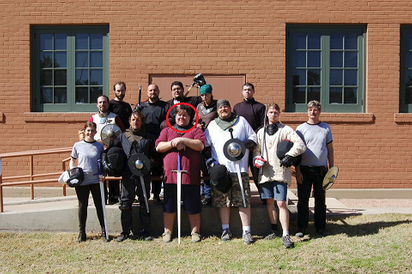 Jim was part of another HEMA group I had never heard of called, La Fratellanza. They met at a public park and to me it seemed like a great idea to cross-train at the same place. In hindsight, I should have asked first, and I suggest if you do cross-train you at least ask the other club if they want you there. Things went well enough and we tagged along with La Fratellanza and though the club is no more, a good handful of their members are with the Phoenix Society. I was fairly oblivious to hard feelings, because by now you all should know I'm quite mad. The park as a venue was great. People did wander past and visit us. People were drawn in by our website and physical presence. Most who came did not stay for long and even today, this is not unusual in my club. Many people like the IDEA of swordplay, but not so much the work involved in it. Parks come with lots of open space and you can get a large club there. However, parks come with some pitfalls you should be aware of. Parks can be and are rented out. There are days you may show up and some festival has sprung up. Parks can change when they water the lawn. At one park we trained at the sprinklers varied when they came on. More than a few times we had to flee as water sprouted from the ground in great torrents. Park officials, deep, deep, deep down, wish no one would go to the park except homeless people. As we stayed longer and longer at the park, and as our uniformed look developed, park officials asked about venue insurance (more on that later). They asked we not always show up without scheduling with them. They asked we not stay too long. They insisted we don't deal with money on the park grounds. Meanwhile, an encampment of homeless people openly did drugs, set up tents, and shopping cart barricades. For the up and coming HEMA instructor, parks are a great way to start. However, be prepared to deal with park officials as well as weather. We eventually grew tired of the park. It had worked for years, but in Arizona, where it can be 120 degrees, outdoor work became tiresome. On a whim, John and I drove to the Irish Cultural Center where they have a castle. It seemed like a good fit and to my absolute delight they let us rent out space. It wasn't a large hall, but it had wooden floors, very tall ceilings and air conditioning. Because we were a part of the HEMA Alliance (more on that later), the venue did not cost us much. The Irish Cultural Center was a fine fit, but we could only rent it in the summer, leaving us stuck between the park and the castle. While the facility was great, the woman who arranged it for us retired and we also knew we were outgrowing it. Our advertisements online, our continual and steady presence and our uniformed look had all paid off. We were eager for our own place and one of our members stopped by an MMA gym. The gym had poor AC, tall ceilings and a guy willing to rent out space. We had finally done it, we had a permanent space of our own. However, crisis is never far off. One day I received a call from the other two who leased the space out. The owner had stripped parts from the building and vanished. We had only been in a year, and it seemed we were homeless- which meant the park was for us! However, a crisis can be turned into an advantage. I talked with the other guys leasing the space and worked out a deal. One of them became the new owner and the two of us chipped in and continued paying rent. My days increased and I went from just 'some guy' to a partner of a sorts. Coe, our patron, is still owner and we are still paying him rent at Miracle Fitness. Because Coe is stable, we have invested in the building. One of my members found a cheap, US Army AC unit to improve cooling. Paint was applied. Ducting for the AC. Fans bought. Storage places moved in. To this day we spend money on improving the building and it is light years beyond what it was. All in all, it took about five years to go from a park, to a partially indoor venue, to a place to call our own where we plan to stay as long as able. John and I's journey is one you can model and my condensed telling of our club's history is for that purpose. 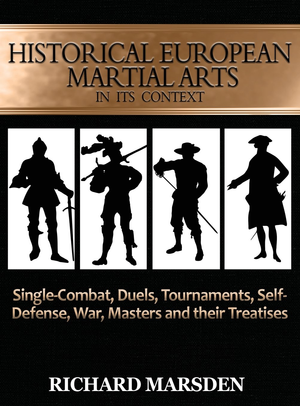 The HEMA Alliance is a non-profit organization dedicated to assisting clubs become successful and educating the public about Historical European Martial Arts. If you want, you can join this organization as a member and get a variety of discounts on HEMA gear from known vendors or you can become an Affiliate. An Affiliate is when a club becomes a part of the HEMA Alliance. When a club does this they are not a for-profit business, which means all money the club raises has to go back into the club and cannot go into the pockets of any members of the club. In fact, a non-profit has quite a few rules you should be aware of which mostly revolve around, tracking the money you pull in, spending it as a non-profit should, and thus not paying taxes on it. I like the HEMA Alliance so much I became is President for a bit and as of the time of this article, I am on its Board of Directors. If your club is an Affiliate and thus a part of the HEMA Alliance, remember that the club is now part of the public. You should never be giving yourself or anyone money unless it is for a good or service- and I don't mean your teaching. It is acceptable to pay an artist to paint your logo on the wall, it is acceptable to pay yourself back if you buy shirts for the club, but it is not acceptable to pay yourself back for air-fare to a tournament under the idea that your presence is vital to the Affiliate. You CAN spend money on club entertainment, but it has to be accessible to everyone in the club. A party for just you and your close club friends is a no-go, a party for the club is acceptable. The rules are very nuanced with the phrase 'reasonable' being used. If your Affiliate made a million dollars a year, it would be acceptable for your Affiliate's leadership to have a yearly meeting at a nice restaurant. Your club will not make that much money, so having a meal with your leadership team at a nice restaurant would be seen as a mismanagement of funds. Who determines what is reasonable and what is not? The IRS, who generally frown anytime non-profit money is used to the benefit of an individual or small group of individuals. The perks of being a HEMA Alliance Affiliate is the non-profit status, the ability to host your usual events knowing they will be insured, and the ability to request financial support for larger events that you run. Insurance is the most misunderstood aspect of the HEMA Alliance. The insurance does NOT protect you from being sued. The insurance does NOT protect your students from being sued. So, what's the point of the insurance? Most venues require it. It protects them from being sued. Even public parks will ask for insurance at some point and the insurance provided by the HEMA Alliance is what they mean. The HEMA Alliance is able to afford insurance for its Affiliates through member and Affiliate dues. The Alliance working as a whole makes the insurance vastly cheaper than if you try to get it on your own. I did get insurance on my own once for one year. It cost me $2000. With the HEMA Alliance my insurance costs my members $26 a year and costs my Affiliate under $300 a year. A big difference and a major reason to have the insurance with the HEMA Alliance. The insurance gives all HEMA Alliance members secondary medical coverage. 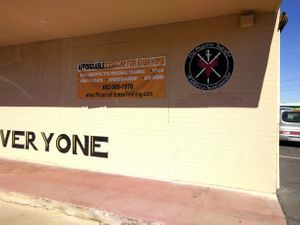 If a Hema Alliance member is hurt at a sanctioned HEMA Alliance event that was upholding the Safety Policy, then they are eligible for coverage. That coverage is secondary medical and so it only kicks in if the injured party's primary insurance is exhausted. All claims get investigated by the HEMA Alliance and then the insurance company. There are rules to follow, including registering events and upholding the Safety Policy and having waivers signed. Remember, this insurance does not protect you from being sued. However, the HEMA Alliance provides waivers which ALL PARTICIPANTS must sign. This helps enforce the above rules and does give you some protection from being sued. Furthermore, in HEMA there is an expectation of risk. If you follow the rules, you are unlikely to be sued, and if you are, by following the rules you are far safer. The insurance is only eligible for HEMA Alliance members and Affiliates. A common question is if you should collect money. If you plan to be a for-profit HEMA business then yes. If you plan to be a non-profit HEMA Alliance Affiliate then yes. Money is needed to buy loaner equipment, insurance, and rent for your venue. This may take time to build up, but it is needed if your club is to grow and succeed. Most martial arts schools charge hundreds of dollars a month. The Phoenix Society charges 10 bucks per session and 150 for three months. We're very cheap! How did we do it? John and I put personal cash into the club. Or, we used to. As our club grew, our coffers grew and these days John and I no longer have to put any money into the club. We earn enough through member dues to cover rent, upgrade the building, have a holiday party, run several large events during the year and buy shirts and loaner equipment. Money needs to be tracked. I'm a bit old fashioned and have a black book I write in. We also have sign in sheets and online spreadsheets to help track quarterly and yearly members. As a perk for these members I pay for their HEMA Alliance membership using club funds. You will need to track money as well. If you are using online payment methods, such as paypal, your account should not be linked to your personal account. If you are a HEMA Alliance non-profit you can talk to your bank about opening a non-profit account. If you are for-profit you should have a business account and do not mingle your personal funds with your business funds or they become one and the same. This can be problematic in a lawsuit. For a HEMA Alliance Affiliate you report your yearly income to the HEMA Alliance who will ask for it and want to know dues, donations, etc. The HEMA Alliance then submits this to the IRS who generally accepts the amount and that's the end of it. For a private for-profit business you need to talk to a tax consultant to best manage your money and keep your business separate from your private funds. You are free to use your money in many ways, but you must report income vs losses/expenses and pay the appropriate taxes. Can I Go From Non-Profit to Private? When a club joins the HEMA Alliance it is no longer a club owned by you. It is a club that is part of the HEMA Alliance. You are under their insurance and tax-sheltered status. It is much like being a Boy Scout Troop under the Boy Scouts of America. If you're curious why it's not like the Girl Scouts, it is because they make soooo much money off cookies that they have their own special laws and rules. If you are an Affiliate you can't legally decide to suddenly become a for-profit company. All products bought with non-taxed club money belongs to the non-profit. What you can do is form a new private club, then buy at a discounted rate, any club gear from the non-profit. The IRS likes things to be reasonable, so you can't create a for-profit club, then 'buy' all the swords from the non-profit at the cost of a dollar a sword. This means you should think seriously about joining the HEMA Alliance. It worked very well for me, but I could never turn the club suddenly into a private money-making operation. All the gear, the venue, the logos, and so-forth are and always will be in the domain of the public. It's like the mob. Once you are in, you don't easily get out. That said, if you plan on being a non-profit, the HEMA Alliance is great because it largely leaves you alone to work, only concerning itself with protecting its insurance, the main reason Affiliates join. No one in the Alliance makes money from the Alliance. I should know. As President and later on the Board of Directors my salary and that of all HEMA Alliance officers is zero. If you end up in the Alliance and do not like it, you can create your own non-profit with the IRS and your local state. It is entirely acceptable to move from one non-profit to the other. So, if you were an Alliance Affiliate and decided to make your own non-profit, you could transfer goods over. Just ask the Alliance first so you don't run afoul of the IRS. The IRS is real. One thing I have encountered is people not liking rules and regulations and noting how they have never had any issues. They are playing with fire. I was President of the HEMA Alliance when it briefly had its IRS non-profit status revoked, leading to a chaotic moment when our insurance and whole organization was in danger of collapsing. What nearly did the HEMAA in? A paperwork error. Not mismanagement of funds. Not breaking any IRS law. It was a filing error. That is all it can take. So, treat the IRS very seriously no matter if you are in the HEMAA, have your own non-profit, or are a for-profit business. Being a small club is easy. When you get larger you have issues to handle. Where do we train? How do we afford rent? Where do we get gear? How much should we charge per month and how do we track it? Doing it all on your own can be difficult and so be sure to have in your club avenues for people to contribute. I could not manage my club on my own today. It is too big and has too much going on. I have a team of people that assist John and I in our efforts and without them, we would be far less successful. Use your talent. However, be smart about it. Money needs to be tracked well. As dues come in and money is expended, be sure to ensure everything is tracked and everything bought has a receipt you take a photo of and put in a file on your computer. Financial issues are things you need to worry about. Does everyone pay their dues? Is the money safe and not being embezzled? Are club members aware of how their dues are spent? Good book-keeping and the occasional balancing of the books will keep you informed. of my works today. Writing is a private venture of mine and I need money. layout of future books and so on. its Historical Context or any of my books found on the main page.